This tutorial is dedicated to pattern #2. This tutorial shows how to tie the arrowed bracelet #2. If you want a printer-friendly version in PDF, click here. 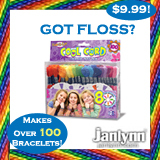 To make this bracelet, you will need yarn or threads in different colors. In this example I've used 8 threads. The length should be about 50 cm (20 in) when you start to tie. Below you see a solution for starting using an overhand knot. 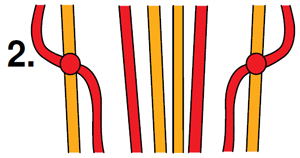 Start with the leftmost and rightmost strings and make forward knots (and backward knots, respectively) towards the middle as the picture above shows. If you've done it right, it will look about like this. 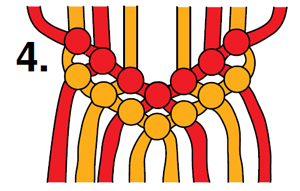 Continue to make knots towards the middle, using the same pair of strings. When they meet in the middle, make either a forward- or backward knot, it doesn't matter. Repeat steps 1 to 4 until the bracelet is long enough. Looks good with: An even number of strings (6 is best for a first time). What you need: 6+ strings, 2 strings of each color. This tutorial will teach with: Red, yellow, and blue. 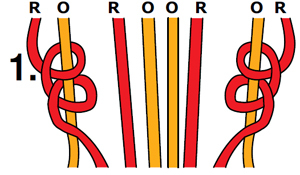 You need to know how to do: Forward Knots (f/k) and Backward Knots (b/k) REMEMBER: TIE DOUBLE KNOTS! It helps that you know how to make the: Diagonal/Candy Stripe, the Chevron on this website. 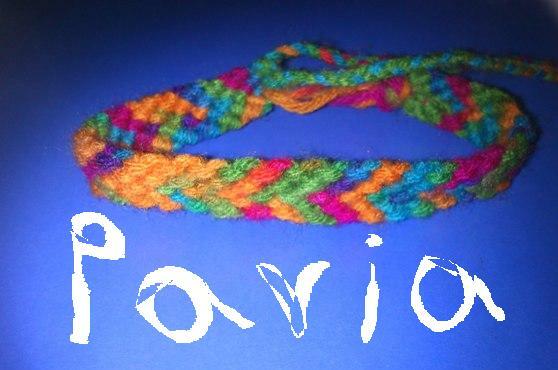 Other Info: The hardest part is tying the strings together in the middle. If you need help, please send me a private message to user "monkshood". Don't hesitate! Just ask! Step 1. Order of string should be: Red, yellow, blue, blue, yellow, red. Step 2. Take the red string on the LEFT and tie a f/k onto the yellow string. Then tie another f/k onto the first blue string. That red should now be one of the middle strings. Step 3. 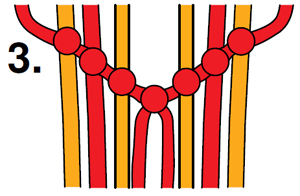 Take the red string on the RIGHT and tie a b/k onto the yellow string on the right. Then tie another b/k onto the blue string in the middle. Now BOTH red string should be side-by-side in the middle. Step 4. Tie the red strings together, using ANY kind of knot. After the first few "arrows" they will automatically start to slant, making an arrow like appearance. Repeat these steps with yellow and blue until the bracelet is as long as you like. Start using more strings as you progress. If you have any questions or trouble, send me a private message to user "monkshood". Feel free to request any tutorials. I'll be glad to help you! Please rate & comment! Thank you! Please see the below link for pictures of my Chevron's! 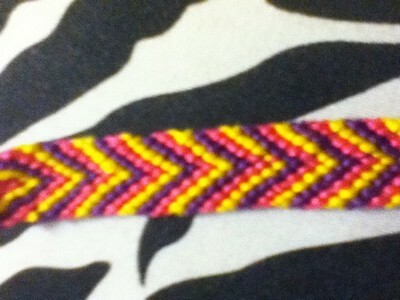 Here's how to make the Chevron/Arrowhead bracelet!!!! Using the four strings on the left, use 1 to tie two overhand knots on 2. 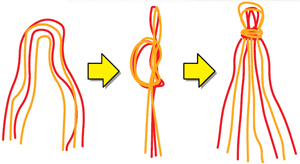 After that, the knot should have made strings 1 & 2 switch places. Now tie 1 onto 3 twice, like you did earlier with 1 & 2. Now do the same with 4. Do the same with the 4 strings on the right, tying 1 onto 2, 3, and 4 twice. Then tie the 1's in the middle together twice. Repeat the instructions, but use 2 in place of 1, so you would tie 2 onto 3, 4, and 1 twice. 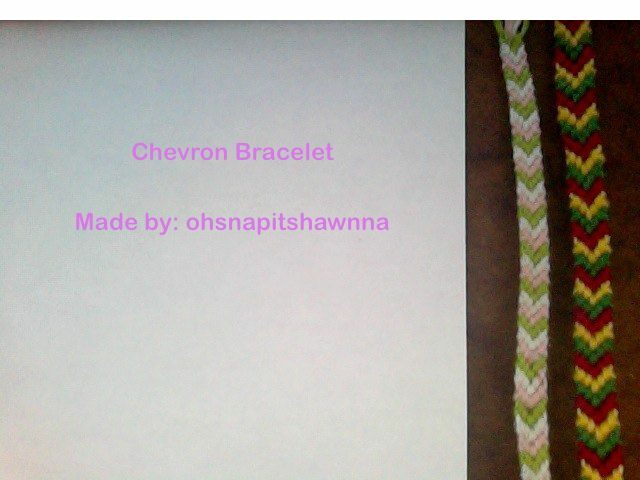 The video below shows how to make a chevron bracelet using 8 strings, followed by a 10 string instruction video. The original author of this tutorial is Stefan, but it has also been edited by Foz, Jeckle, RockePloeger, Sareana, piggyfan2, Kestrel, Alicat, moonaaxo, Twinkles and mysterytour. The tutorial was last updated 3 years ago.